Gymnasium Wall Graphics at Orange Lutheran High School Helps Show Their School Pride! Affordable Vehicle Graphics for Your Fullerton Business! Giving Children Hope Rebrands with Banners, Truck Wraps and Truck Decals! Glacier Design Systems Markets with Fleet Vehicle Graphics in Orange County! Giving Children Hope in Buena Park Brands with Box Truck Wraps! Cuttwood LLC Adds Custom Wall Graphics to Offices in Orange County! CJ Plumbing Promotes Hydro Jetting Services with Ford Van Graphics! Outstanding Logo Lobby Sign for Reliance Real Estate in Fullerton CA! Garza Industry Delivering Brand All Over Orange CA with Fleet Vehicle Wraps! Wellness Medical Center Adds Commercial Van Graphics to Fleet! Wide Format Printed Banners Help You Stand Out in Buena Park CA! Local SK Tools Franchisee Brands with Box Truck Wraps in Orange County! Utility Trailer Wraps for Fullerton Boy Scout Troop 1238! Get Your Orange County President's Day Sale Signs Now! Ice Cream Shop in Buena Park CA Shines with Signage Makeover! All State Police Equipment Company "Shoots" Up the Competition with Banners Stands in Pomona CA! Need Custom Wraps and Graphics for Your Orange County Restaurant? Boys and Girls Club of Buena Park CA Uses Wall Graphics at Annual Fundraiser! Need Contractor Vehicle Vinyl Lettering and Decals in Orange County CA? Glacier Designs Orders Up Custom Wall Art in Huntington Beach CA! Should I Buy Custom Car Decals Online? SuperiorCarWraps.com Offers a Vehicle Graphics Solution for Every Business! Buy Custom 5S and Six Sigma Floor Decals Nationwide! Boys & Girls Club of Buena Park Spruces Things Up with Vinyl Wall Lettering! 5 Ways to Market Your Orange County Business Using Vehicle Graphics! Pet Resort Adds Scion xB to Fleet and Advertises with Window Perf in Brea CA! Stand Out with Vendor and Street Fair Booth Graphics for Orange County! Leasing Office Signs in Tustin CA Help Reel in Tenants! Announce Your Business Is Coming with Banner Signs in Orange County! Party City Gets New Channel Letters at The Village at Orange Mall! What Are Vehicle Wraps Made Of? Do Vehicle Wraps Protect My Car in Orange County? Door Panel Trailer Graphics for G&G Door Products in Buena Park CA! Are Your Car Wraps in Orange County Superior? Lavish Vodka Cocktails Brands with Vehicle Graphics in Anaheim CA! Need Architectural Renderings for Your Project in Orange County? Buena Park Honda Advertises with Vehicle Vinyl Lettering & Graphics! Lube Express in Buena Park Advertises with Service Menu Signs! When Do I Need a Sign Permit in Fullerton CA? University of Tennessee Alumni Adds School Pride Truck Graphics! Lomita Care Center Benefits from Exterior Roof Sign Refurbishing! Looking for Carbon Fiber Wraps in Orange County? Cal State Fullerton's Amazing Stadium Vinyl Wall Wrap! Orange Family Dental Care Brands with Door and Window Graphics in Anaheim! Sell More Homes with Residential Real Estate Signs for Fullerton CA! When Only the Best High Resolution Banners and Posters Will Do! T3 Motion Wrapped for Election Campaign in Orange County! Rejuvenation of Hyundai Santa Fe with Color Change Vehicle Wraps! Looking for RV Trailer Graphics in Orange County? Phone Stylist Shines with New Buena Park Mall Signs! Glacier Design Markets with New Outdoor and Indoor Signs in Orange County! Frosted and Etched Vinyl Window Graphic Choices! How to Maximize Your Vehicle Graphics Budget! Vinyl Decals Are Hot in Orange County! Trade Show Graphics for Device Talks West in Irvine CA! Karlin & Karlin Invites with New Lobby Sign in L.A. Secure One Capital Invites with Window Graphics and Lobby Sign in Orange County! Amazing Remote Control Plane Vinyl Decals Make "Flyer" Happy! Interior and Exterior Signage Makeover for Alloy Die Casting in Orange County! You've Got Maids Advertises with Franchise Car Wraps in Orange County! Vaco Professional Services Spruces up New Office with Lobby Sign in Irvine CA! Progressive Community & Vocational Services Refurbishes Monument Sign! Can Customers Clearly See What Your Auto Repair Center Offers? What Can You Do with Vinyl Decals in Orange County? Colorful, Vibrant Banners Just for Orange County! Marti's Bar Goes for a "Cheers" Look with Vinyl Wraps! Need Franchise Window Decals in Orange County? Product Wall Murals for Eurowest Showroom Are Crisp and Realistic! Auto Dealerships: Have You Added Graphics to Your Shuttles and Parts Trucks? Mall Signs for Stores and Kiosks in Buena Park, Orange and Brea CA! Need Commercial Truck Lettering in Orange County? Car Dealer Adds Exterior Safety Panel Sign in Orange County! Pet Groomer Lights Up with Face Lit Channel Letters in Orange County! Vibrant Wall Murals Shine at the Second Baptist Church in Santa Ana! Design Infini Uses Die Cut Vinyl Graphics on Jeep and Toyota Tundra in Orange County! Brushed Metal Lobby Sign for Fullerton Craft Smiles Dental Office! Comforting Lobby Sign for Orange County Child Abuse Prevention Center! Need Your Sign Face on Your Pole Cabinet Sign Replaced in Orange County? What Is Pylon Monument Sign Neutralization and Why Would You Need It? Need New Signs When Relocating Your Business in Orange County? Yes, We Can Vinyl Wrap Arcade Games! Restaurant Remodel Includes Cafeteria Style Signs and Wall Graphics! It's "See-Through" Vinyl Window Graphics for Orange CA Optometrist! 4 Reasons Why Vehicle Graphics will Brand Your Business! The Pizza Press Opens and Adds Vinyl Door & Window Graphics! Vertical "Pillar" Banners for Orange Lutheran High School! Golden Greek Fresh Adds Box Truck Wraps in Orange County! We Fabricate and Ship Lobby Signs all Over the U.S.! Go Salad Shows Off New Menu Boards in Orange County! BodyCentre Wellness Spa Advertises with Partial Vehicle Wraps! Got Maids Adds Chevy Aveo Franchise Graphics to Fleet in the OC! Bail Bond Business Advertises with Scion xB Vehicle Wraps! New Building Sign for Quest Building Products in Anaheim! A Full Vehicle Wrap Look for 1/3 of the Price? eFileFolders' Ford Flex! Cozzini Brothers Adds Vinyl Decals to Fleet Vehicles Across the US! Do Your Auto Repair Signs Need to be Updated in Orange County? Bizol Oil Promotes Service Center with Sprinter Van Graphics! Amazing Office Relocation Signage for Rescue One Financial! Cal State Fullerton Adds LED Sign to Book and Student Store! Pizza Nora's New Chalkboard Style Menu Boards Make Ordering Easy! Very "Social" Lobby Sign for Rallio in Irvine CA! Life-Like Acrylic Wall Signs for the Snow Station in Mission Viejo CA! Super Hero Captain America Car Decals in Orange County! West Coast Pluming Adds "Mascot" Van Graphics to Boost Brand Recognition! Premier Chevy Makes Things Easy with Parking and Directional Signs! It's Opening Soon Banners for My Gym in Orange County! Cal State Fullerton's Titan Shops Wraps Concession Kiosk! Buena Park Mall Tenant? See What Signs & Graphics Are Available! Retail Delivery Truck Wraps in Los Angeles County that Really Stand Out! Cohesive Vinyl Graphics Help American Martial Arts Market their Businesses in Orange County! Update Your Message with Mall Signs and Graphics in Buena Park! 5 Vehicle Wrap Examples to Consider in Orange County! Rebrand Your Orange County Restaurant with New Signs & Graphics! Custom Wall Graphics and Wall Murals for Orange County Small Businesses! Textured Window Graphics for the Mulberry Street Ristorante in Fullerton CA! Dimensional Letter Lobby Sign for Professional Collision Auto Body & Paint! Illumination Foundation Spreads Message with RV Wraps in Orange County! Ford Transit Van Graphics for Willy's Locksmith! Body Rhythms Reopens and Brands with Acrylic Lobby Sign in Irvine CA! Custom Lobby Sign for CalTech Welcomes! Product Showroom Graphic Panels for Anaheim! Display Your Products! High Resolution Wall Photos Entice Clients in Orange County! Cost Effective Delivery Truck Wraps in Orange County Help You Get Noticed! Dimensional Letter Lobby Signs Great for Nonprofits in Orange County! Brand Your Orange County Business with Custom Lobby Signs! Custom Printed Windflags Help Orange County Businesses Get Noticed! Sales Room Wall Signs Motivate Realtors in Orange County! Superior Signs and Graphics Helps Property Management Companies in Orange County! Anti-graffiti For Lease Signs Help Property Managers in Orange County Combat Graffiti and Lease Vacant Units Faster! Best Uses for Foam Letters in Orange County CA! Fast, Safe, and Efficient Sign Removals in Orange and Los Angeles Counties! Teaser Wall Graphics Announce Starbucks Coming Soon to Cal State Fullerton Student Union! Electrical Sign Maintenance and Refurbishing in Orange County! Select Adds New Equipment to Buena Park Fleet and Brands with Vehicle Graphics! Fleet Vehicle Graphics Programs in Orange County and Los Angeles that Work! Professional Vehicle Graphics Installation in Orange County by 3M Preferred Installers! Entry Wall Mural for Santa Ana Mortgage Company Adds to Office Décor and Makes a Statement! Superior Signs and Graphics Helps Orange County Mall with Fast Turnaround and Cost Saving Signage Tactics! Van Graphics Add Professional Look to Orange County Environmental Company! Custom 3D Lobby Signs for Businesses in Orange County! Low Cost Sign Makeover for The Palms Apartment Complex in Anaheim! Vinyl Graphics for Trade Show Displays at Long Beach and Anaheim Convention Centers! New Aluminum Letter Building Sign for Huntington Beach Manufacturer Makes a Statement! Wall Mural for Cal State Fullerton Titan Shops Shows School Pride! 3D Lobby Logo Sign Helps Physical Therapy Provider Stand Out in Fountain Valley! Service Businesses in Orange County Need a Great Sign and Graphics Company! Etched Glass Stripes and Graphics for Auto Dealership in Los Angeles Adds Branding and Classy Look! Van Decals for Cal State Fullerton Titan Shops – by Superior Signs and Graphics! Showroom Logo Signs Highlight High-End Products that Costa Mesa Electronics Company Offers! Custom Designed Restaurant Wall Murals and Graphics Impress Orange County Customers! Restaurant Wall Décor Sets the Theme for Scoops Ice Cream and Creamery in Orange County! Amazing Lobby Logo Signs and Graphics Welcome Visitors at Costa Mesa Audio Video Company's New Location! Custom Wall Murals and 3D Logo Signs for Restaurants in Orange County! Wall Graphics and Custom Designed Logo Signs Add Wow Factor to Branded Restaurants in Orange County! Orange County Sign Company Creates Dimensional Logo, Wall Menu and Wall Graphics for Italian Coffee Bar! Orange County Sign and Graphics Company Adds Flair to Healthy Eatery! Delivery Truck Vinyl Wrap for Orange Lutheran High School! Vinyl Graphics Installation for Tanker Trucks in Los Angeles County! Brand Your Orange County Restaurant with Unique Wall Murals and Wall Décor! Wall Map Murals for Offices in Orange County CA! Vinyl Wrap Gives Ducati Motorcycles in La Mirada a New Look for Their Sport Trailer! Office Wall Murals Tell a Success Story in Orange County CA! Zespri Kiwi Shows Off Brand with 3D Letter Logo Lobby Sign in Orange County CA! Businesses That Are Relocating to Orange County Need the Help of a Great Sign Company! Mission, Vision, and Values Lobby Signs for Los Angeles Tech Company set the Tone for Their Business! Impactful Wall Mural Doubles as the Menu at Jumping Dak Restaurant in Buena Park! Eye Catching Window Graphics for Mall Retailers in Orange County! Low-Cost Commercial Van Graphics Give an Eye-Catching, Professional Look for Orange County Business! Vinyl Decal Installations for Commercial Fleets in Los Angeles! Signs and Graphics for Shopping Malls in Orange County! Full Color Wall Murals and Graphics for Office, Retail and Commercial Applications in Orange County! Commercial Property Signs for Management Companies in Orange County! Foam Letter Building Signs in Orange County – Fabrication, Removal, and Installation! Custom Designed Vinyl Wraps for Almost Any Vehicle in Orange County! Entry Wall Graphics Greet Visitors in the Lobby of Nihon Kohden in Irvine! Delivery Truck Graphics Help Cal State Fullerton Take Advantage of an Existing Asset for Advertising! Brushed Metal Lobby Sign Adds Tasteful Elegance to New Business Logo in Orange County! New Graphics for Monument Sign in Cypress Gives an Updated Look! Decals and Lettering Give Painting Truck a Professional Look in Orange County! Polished Metal Lobby Sign Gives Costa Mesa Mortgage Company a Great Look for Its New Office Space! Lyft Vehicles Wrapped for Special Promotion in Orange County by Superior Signs and Graphics! Brushed Metal Lobby Signs for Businesses in Santa Ana! Wall Mural For Cypress College Culinary Arts Department Makes Visitors Hungry for More! Lobby Logo Sign and Office Door Signs Help Brand Southern California Clinical Research Company’s Offices! Eye Catching Window Graphics Help Fullerton Martial Arts Studio Stand Out from the Competition! New Graphics for Anaheim Pylon Sign Give it a Face Lift! Relocation of Established Italian Restaurant Requires New Signs and Graphics to Announce Its New Huntington Beach Location! Signs and Graphics Face Lift for CSUF Fresh Kitchen Restaurant! Custom 3D Logo Sign for Los Angeles Construction Company Adds Flair to the Office Lobby! Fullerton Taco Franchise Brands Itself with Colorful Eye-Popping Graphics! Coming Soon Window Graphics Announce the Future Opening of New Santa Ana Ale House! New Illuminated Sign Facings for Costa Mesa Medical Supplies Retailer Grab Commuters’ Attention on a Busy Street! Custom “See Through” Window Graphics for HairArt Orange County Draw Attention and Display Their Work! Custom Lobby Logo Wall Sign Created for Chino Construction Firm to Enhance Industrial Chic Feel of Its New Offices! New Signs for an HOA in Los Angeles Give the Property a New Look! Long Lasting 3M Commercial Truck Graphics Work for La Habra Cement Finishing Company! Dimensional Letter Sign for Real Estate Broker in Newport Beach Completes Building Facade! Box Truck Vinyl Graphics Help Brand New Addition to Contents Pack-Out Company’s Fleet in Buena Park! Window Graphics and Banner Stands help La Mirada Eyebrow Threading Store Communicate Its Many Services! Retail Property “For Lease” Window Graphics Help Garden Grove Landlord Fill Vacancy! Buena Park Sign Company Helps General Container Rebrand Its Facility! 3D Lobby Logo Signs Mark the Entrances of these Irvine Companies and Reinforce Their Brand Image! Custom Signs and Graphics for Apartment Communities in Orange County! Retail Makeover for New Tenant Includes Building, Pylon, and Lobby Signs with Custom Window and Wall Graphics in Orange County! Window Graphics That Drive Customer Traffic for Retailers in Orange County! New Graphic Panels for Lighted Signs in Orange County! Shopping Center Construction Project in Garden Grove Gets Eye-Catching Commercial Property For Lease Sign to Announce Its Opening! Custom Decals and Lettering for Retail Fixture Installation Company’s Fleet of Cargo Vans in Anaheim! Wall Murals for Quality Custom Distribution Company Give Logistics Center an Amazing Makeover in Los Angeles! Google Maps Image on a Vinyl Wrap Gives Cool New Look to Buena Park Tow Truck! Retail Kiosk Signs for Buena Park Money Transfer Company Bring in More Customer Traffic! Wall Mural Brands Entry of Insurance Company’s New Offices in Irvine! 3D Lobby Logo Signs Add Branding and a Professional Look to Orange County Offices! Additional Wall Graphics Help Finish Logistics Center Décor in the City of Industry! Graphics and Wall Murals for Schools in Orange County! Vinyl Decals and Graphics for Commercial Truck Fleets in Orange County! Custom Designed Matte Finish Vehicle Wraps and Graphics in Buena Park! Orange County Sign Company Proves to be a Great Resource During Warehouse Relocation! Custom Wall Murals and Graphics for Office Spaces in Orange County! Warehouse Signs and Graphics for Southern California Ripening Company! Custom Brushed Aluminum Lobby Sign for Beverly Hills Plastic Surgeon! Indoor Signs, Building Signs, and Directional Signs for Newport Beach Business Add a Touch of Class! Window Graphics and Wall Murals Decorate Newly Remodeled Space at the Aliso Viejo Library! Wall Murals Add Character to Los Angeles Area Distribution Center! Dubai Sauce Restaurant in Los Angeles Gets a Makeover with Custom Wall Murals! Fleet Graphics Programs for Orange County Service Businesses! Take Advantage of Thousands of Consumer Impressions Daily! Custom 3D Lobby Logo and Conference Room Wall Signs Brand New Fullerton Office! Escape Room Window Graphics at Los Angeles Mall Block Construction and Announce, “Coming Soon”! Interior Graphics for Gas Station Convenience Store by Superior Signs and Graphics in Buena Park! Signs and Graphics for Distribution Centers in Los Angeles! Softball Dugout Vinyl Wraps for Santa Ana High School Show Team Pride! Buena Park Commercial Property For Lease Signs Designed, Produced and Installed Fast! Anti-Graffiti Apartment Complex Sign Rebrands Anaheim Apartment Community! Monument Sign Refacing for Cerritos Logistics Company’s New Location! Custom Lobby Logo Sign for Newport Beach, CA Law Firm Adds Branding and an Upscale Look! Anaheim Convention Center Car Park Gets Custom Graphics for Pay Booths! Window and Wall Graphics Brand Cypress Offices of Automotive Lubricants Manufacturer! 3D Exterior Lettering and Logo for New Law Offices in Santa Ana! Big Vinyl Lettering Calls Attention to Delivery Company’s New Van! Costa Mesa Cyclery Uses Eye Catching Window Graphics to Advertise! Compton Warehousing Company Brands Offices with Wall Lettering! Huge Timeline Wall Mural and Giant Safety Banners for Fontana Distribution Center! Building Signs and Window Lettering Announce Gil Cisneros for Congress Campaign Office in Brea! Brushed Metal Lobby Logo Sign for Advisory Firm in Los Angeles Stands Out! Wall Graphics for Newport Harbor High Dance Production! Warehouse and Distribution Center Signs and Graphics in La Mirada CA! Signs and Graphics Give a New Look to Anaheim Convention Center Parking Garage! Wall Graphics Add to Décor at Rio Hondo College in Whittier! Retail Graphics Packages for Companies in Orange County, CA! Custom 3D Lobby Sign for Home Improvement Contractor in Upland CA! New Building Sign for RE/MAX in Downtown Fullerton Really Stands Out! Lobby Logo Signs Welcome Visitors and Employees at Orange County Offices! Etched and Frosted Window Treatments and Graphics for Businesses in Orange County, CA! Coming Soon Signs for New Building Developments in Los Angeles! Huge Wall Murals Project for Torrance Industrial Facility Adds Flair and Reinforces Corporate Messages! Gate Signs and Logo Signs for La Mirada Truck Dealership! Logo Change is a Good Opportunity for Anaheim Businesses to Renew Old Signage! Directional Signs and Building Identifier Signs for Los Angeles Factory Campus Help Visitors Find Their Way! Low-Cost Commercial Van Graphics in Anaheim, CA! Perforated Window Graphics on Pomona Storefront Help Advertise without Blocking Visibility! New Pylon Sign Panels for Anaheim Psychic Reader Get Attention! Custom Designed Car Wraps Installed By Our 3M Preferred Installers in Buena Park! Custom Designed Van Wrap for Placentia Martial Arts Academy Takes Advantage of Existing Vehicle Asset for Advertising! Custom 3D Lobby Logo Signs Designed, Fabricated, and Installed by Superior Signs and Graphics in Buena Park! Commercial Property Signs Designed, Fabricated, and Installed by Superior Signs and Graphics in Buena Park! Custom Floor Graphics Brand Entryway at Los Angeles Studio Offices! Custom Made Wall Murals Add to the Theme and Décor of Brea Physical Therapy Provider Facilities! Eye-Catching Auto Service Center Signs and Graphics in Fullerton! Custom Designed Lobby Logo Signs for Businesses in Orange County, CA! Custom Aluminum Building Logo Signs for Santa Fe Springs Laboratory! Custom 3D Lobby Logo Mounted on Brushed Aluminum Panel Adds Pizzazz to Garden Grove Treatment Facility! Custom Lobby Logo Signs and Window Graphics for Irvine Cosmetics Manufacturer! Decals and Lettering for Commercial Vans in Fullerton Adds a Professional Look! Fleet Graphics Programs That Save Money for Companies in Orange County! New Wall Mural Installed on Brick Surface Welcomes Students and Faculty to Middle School in Whittier! Huge Sign and Graphics Project for Whittier Middle School Motivates Students to Perform at Their Best! Custom Lobby Sign for Los Angeles Furniture Wholesaler Adds Professional Look to Showroom! Custom Wall Murals for Buena Park Contractors Add Theme and Branding to Their Offices! New Look for Commercial Property For Lease Signs for Anaheim Property Management Company! Parking and Wayfinding Signs Help Anaheim Medical Office Manage Traffic and Ensure Available Customer Parking Spaces! Custom Brushed Metal Lobby Signs for Offices in Irvine, CA! Wide Format Banners Attract Attention for La Mirada Animal Hospital! Custom 3D Logo Sign for Physical Therapy Provider in Los Alamitos Brands Its Offices! Anti-Graffiti Window Graphics Advertise Commercial Property For Lease in Anaheim! Custom 3D Lobby Logo Signs Welcome Employees and Visitors to Garden Grove Facility! Custom Designed Printed Wall Art for Retailers in Los Angeles! Utility Trailer Graphics Announce the Arrival of the San Pedro High School Marching Band! School District in Santa Fe Springs Adds Signs and Graphics to a Conference Room Reinforcing Its Mission and Core Principles! Perforated Window Graphics Advertise for Retailers in Paramount and Orange, CA! Custom Lobby Logo Signs for Offices in Orange County, CA! See Through Window Graphics and Backlit Sign Graphics Advertise for Money Transfer Company in Los Angeles! Wall Graphics for School Athletics Departments in Orange County, CA Motivate Student Athletes! 3D Lobby Logo Sign Brands Cypress Cosmetics Business! Office Wall Décor is Easy with 3D Lobby Signs and Wall Graphics in La Mirada! Warehouse Signs and Graphics for Logistics Companies in Los Angeles! Office Wall Murals in Newport Beach Complete Real Estate Developer’s New Décor! Custom Designed 3D Lobby Logos for Offices in Irvine! New Logo Design Means a New and More Durable Building Sign for EVG in Anaheim! Wall Graphics for High School Athletics Department in Orange, CA Recognize High Achievers! Custom Lobby Logo Signs for Businesses in Los Angeles! 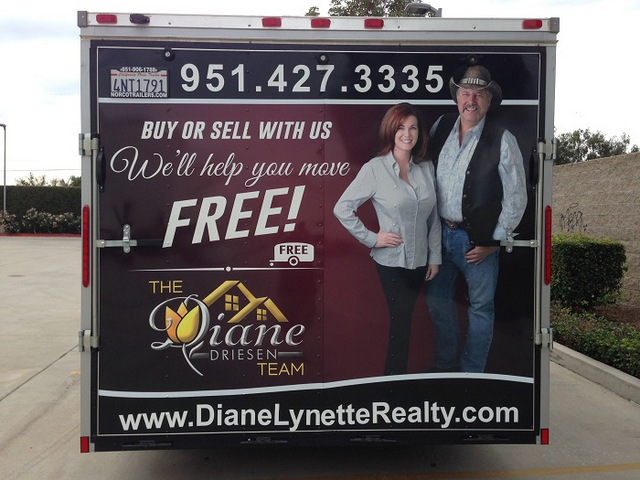 Last year, we worked with realtor Diane Lynette in Norco. Located at 1260 Corona Pointe, she needed a post and panel marker that would advertise her business. Not too long ago, we got another call from Diane Lynette Realty. The professional needed vehicle graphics for realtors in Orange County. Advertise on your "moving" utility trailer! 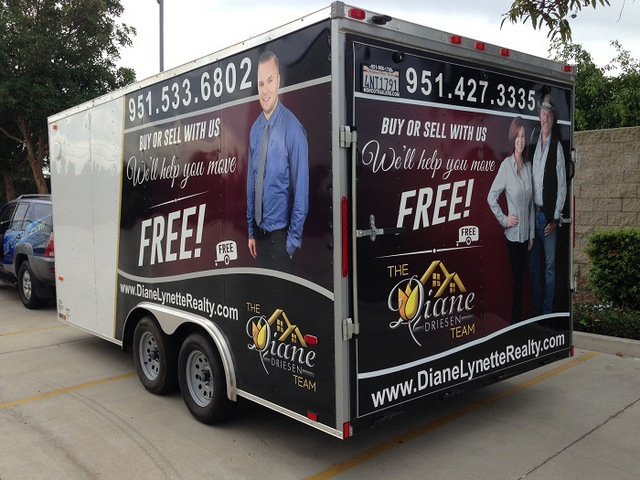 Diane uses a utility trailer for advertising her business. She allows clients to use it when moving. 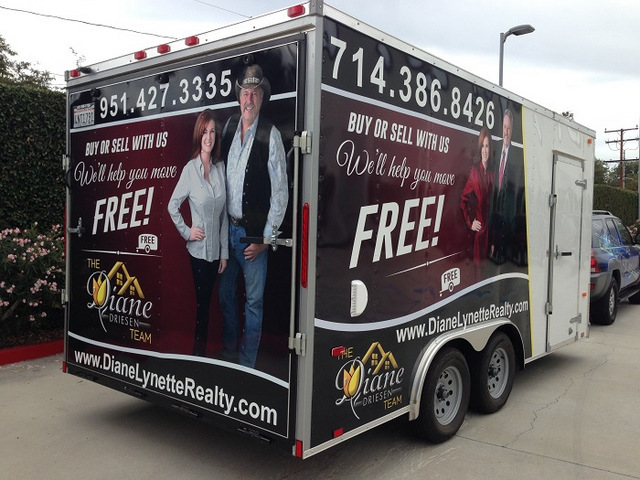 Taking a page from the playbook of other real estate professionals, she wanted to brand and market with this trailer while providing the benefit to her clients. We collaborated on the design of the graphics package and relied on Avery Supercast wrap film with a gloss laminate. This extremely durable but pliable material is ideal for use on the trailer with its rivets. The finished design displays her phone number, website address and explanation of the trailer’s function. It also shows the word “free” in a prominent position. This ensures that onlookers will pay close attention to the wording. To keep the eyes trained on the side of the trailer, the real estate professional decided on an italic font, which takes just a bit longer to read but keeps the attention of passersby and motorists focused on the wording. It is interesting to note that we put different graphics – with the same message – on the three visible sides of the trailer. Get your name out there 365 days a year! Adding a graphics package to a trailer is an ingenious way of gaining all the advantages of mobile marketing – even though you are not the one doing the driving. The clients who are hitching up the trailer to their trucks do the driving and take the realtor’s marketing and branding messages on the road. Other professionals may have similar options. Loaner cars. Whether you operate a dealership’s vehicle maintenance department or a stand-alone garage, when your customers have their cars serviced, they need alternative transportation. Provide professionally wrapped loaner cars that give your customers convenient complimentary transportation. They then take your marketing message to their work or neighborhood. Equipment trailers. If you rent gardening equipment or similar large tools, offer to provide a trailer that helps your customers to haul the items. Treat this trailer with a graphics and lettering package that advertises your company. Toy hauler. When you rent jet skis or dirt bikes, throw in a toy hauler to let clients tow them. Display your logo and company name as well as contact information on this detachable hauler. Trailer wraps market to every demographic! Whether you need vehicle graphics for realtors in Orange County or wraps for trailers that show off your car dealership’s information, our technicians handle all types of packages. The professionals at Superior Signs and Graphics routinely work with companies of all business backgrounds to put together eye-grabbing mobile marketing displays. Our graphic artists incorporate the artwork that you already have on file. In the alternative, we gladly create a completely new look from the ground up. Call us today to get started.